along with hearts and angels! You know how I enjoy extracting motifs and smaller designs from a larger pattern and highlighting them through colour. Don’t get me wrong – I love all-white snowflakes (such as this one), but the need to play around gets the better of me ;-P Perhaps I use colours as a Freudian cover-up to hide my tatting flaws ?! Also, the stiffness of some of the white threads is off-putting. Sharon Briggs has been on a snowflake-designing spree for the past several weeks. And I jumped in with a few flowery expressions – flower flakes! These were made a few weeks back during my convalescence, with scarcely any notes. I don’t even remember my tatting order. A couple of them cupped a bit, but in the end they blocked out fine. Some of these could look good tessellated, hence I have included dimensions for both point-to-point and the length as a tiled motif. TIP : All her snowflakes can be worked continuously. 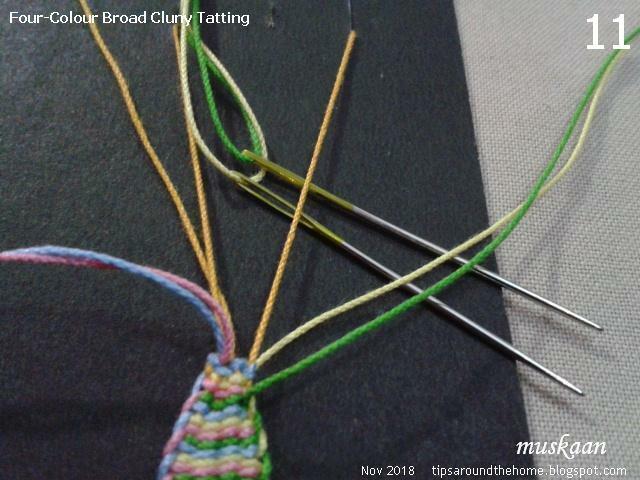 Due to use of colours, I worked some of the rounds separately, while in some one thread continued for some rounds. Working in one pass is optional – for those not comfortable with split rings and split chains, cut and tie after a round and start next round afresh. Techniques I used : 2-shuttle, one-pass, ctm, rosette/rose medallion, daisy medallion, lock join, thrown/floating rings, dimpled rings, split ring &/or split chain to climb out/climb in, 3 threads (double shuttle). She called it "unimaginative". Hardly ! I could see a poinsettia there, though my model seems to be squatter than her's. I wouldn’t mind adding one more round to bring in a more petal-y poinsettia look. I came across blue bonnets in a story I was reading and loved them.... which is how I had visualized this in shades of blue. 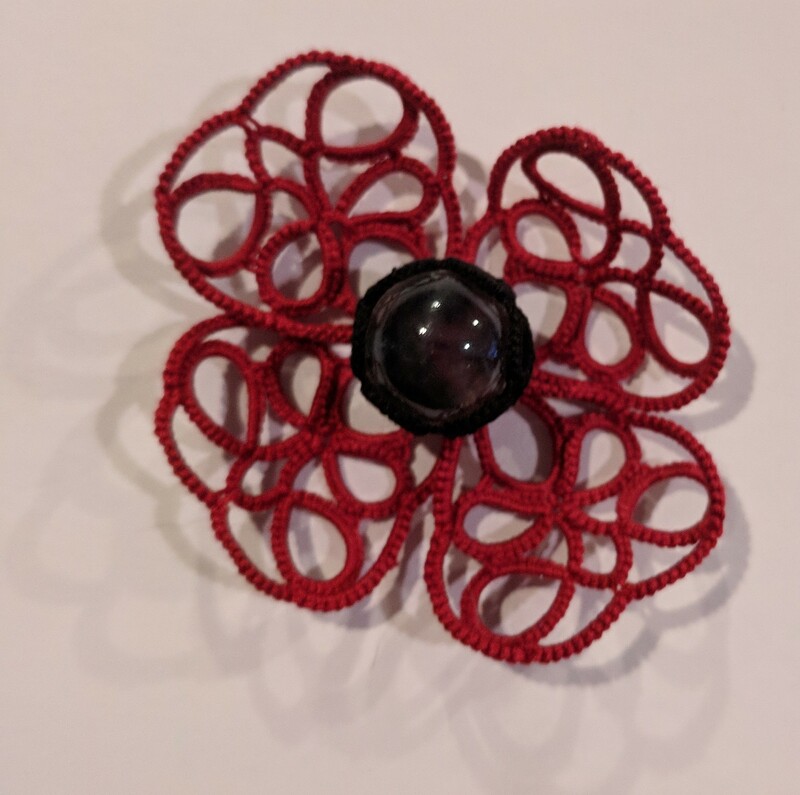 I wanted to make the outer round in a darker shade, except I'd have to use embroidery threads & didn't want to hamper my tatting flow. I like how this turned out !!! I simply love the ‘filigree’ and colours would probably take away from that look. Hence, a white lily ; the central ring could’ve been yellow, though. I'm hoping to give this another go in colours though - it's such a pretty pattern! I’m pretty certain I mixed up 2 whites while making it – one was a tad finer, vintage. Sharon also has quite a few flakes with dimpled heart motifs. I test-tatted this Daisy Ring Heart pattern. the outermost round required 7 ds chain segments throughout – just as Sharon had predicted. But do you see the angels between the hearts?! Ever since her first heart snowflake, I wanted to make only the heart in red. I’ll get to that, but for this December 22, 2018 pattern I used pink hearts against a cream thread. I started with one shuttle and ball, ctm for the central ring. Then I included a pink shuttle for the hearts. 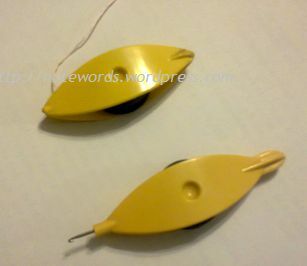 Since I couldn’t work the connecting chains with direct tatting (unflipped or reverse stitch), they were tatted with double shuttles – the 2 shuttles stuck together temporarily. The 2 outer rounds were worked with single shuttle and ball again. The above pic was taken before I worked the pink hearts flake. I now have 8 of her 2018 flakes tatted (2 more flower flakes here). There are still a few more of her flakes I’d like to tat in the coming days. Except she’s belting them out faster than I can tat ;-P What a bonanza for tatters !!! Thank you, Sharon, for a fun-filled winter, and the promise of more to come! And since this post is already a tad late, why not include b-Elated wishes for Hanukkah ! These card toppers were made in another lifetime, in another millennium. My sister & I made twin cards, often using different background and thread colour combos. Most of them got sent out over the years. But the joyous memory of making these still lingers. These are patterns from a book lent to me by a friend while we were studying for our BEd – really wish I had the name of the book. Sis and I spent an entire holiday stitching these. 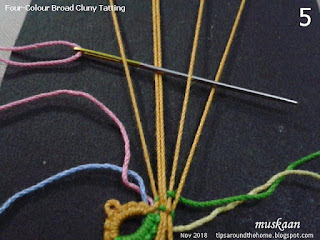 These are so much easier and handier than the actual string art that uses nails and wires. And so much more practical to gift, share, send. What's a moth doing in a choir of angels, you ask?! Tatting is full of surprises … read on. We’ve all come across this beautiful angel by wiki on pinterest. Tereska recently made many. One of my friends asked me about recreating the effect of the central joins which led me tat it up. It is a very clever pattern using basic techniques and a long picot for the halo (top right inset) The first ring has a longish picot, too, for linking later chains. The head is a mock ring – simple chain linked on either side with a lock join. Not wishing to continue with this thick thread, yet not wanting to throw away the piece, I cut & tied, then whip stitched back to the ‘neck’ where I curled the head back from the front, and secured it. Then snipped off the long picot to look like antennae. Kind of cute, eh? So That’s how this angel became a moth. I started over in white Anchor size 40 and the finished angel is 2½cms wide x 4cms tall. Unhappy with my block tatting! Techniques : ring, chain, lock join, central picot, long picot, block tatting, decorative picots. TIP : It can be worked with one shuttle and ball, ctm, and for block tatting I worked from the front only, by resorting to direct tatting. Wiki has some really cute tatted doodles on her blog. An angel needs company, so I started on Ruth Perry’s new angel pattern. Again, my tatting leaves much to be desired. The size of joining picots is important here. In Anchor size 40, it is 2½ inches wide and tall. The head uses padded double stitch (pds or BDS or DDS), and a long picot is twisted for halo. 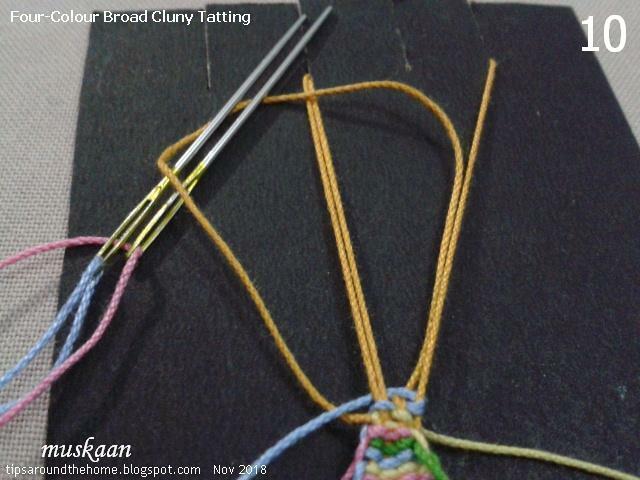 Split rings and chains with decorative picots are used to tat the wings and body in one go. The skirt of simple rings and chains is worked and joined on the go. I like the lacy fulsomeness of this pattern! Note: One 7ds segment for the wing center (SR) is missing in the instructions. Two’s company, but three’s a choir! Loved the angel earrings Bernice shared here. It is such an elegant pattern by Sezione Hobbystica and can be found here. I scrolled through her site and found a great drawing app for tatting !!! Played with it a bit on my tablet - fairly easy and straightforward. But it opens only in Chrome. Just wanted to let you know that the worst is now behind. Today should be the last of the cumbersomeness that clogs up my days, phew. 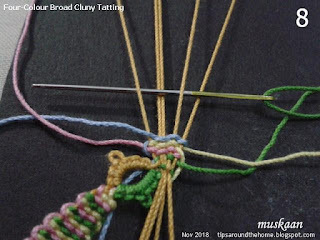 I hope to get back into the mental and physical rhythm of tatting and blogging immediately and gain the lost momentum - as far as the short cold days permit. Know that I miss BlogLand and TatLand ! Hope to be back in full force sooner than later, so hang in there dear friends, correspondents, and readers and enjoy the festive season. Can't wait to catch up with blogging and commenting and interacting with you. I had bought those Lizbeth 20 mixes in order to work my own patterns in that thread so as to have a more universal, uniform, comparable, and easily convertible measurement. Unlike the newer Anchor (Madura Coats India) size 20 which is all over the place and way thicker than a Lizbeth 20. With the finished dimensions provided earlier and now, you can easily see the difference in the old (Anchor 20) and the new (Lizbeth 20) snowflake! I loaded 2 shuttles with Lizbeth size 20 thread and got to work. It felt good to tat a done pattern in softer ice-blue shades after all those colourful blossoms. I am sharing only tweaks here, with stitches inked in the respective picture. Links are provided for the detailed patterns. Instead of a central picot which accommodates all subsequent rings, I linked adjacent rings through very small picots. This also meant that decorative picots can be added in the central negative space. Measurement: 1½ inches point to point. Main techniques : 2 shuttles, ctm. Thrown/floating rings (TR) which require switching shuttle (ss) before and after. **Ch: 3 p 3 ss TR (2p2p2) ss Ch:3 p 3. rw. Repeat ** to ** till there are 6 inner rings. Finish off with chain. I had shared the design process for this flake and the reason why it had bilateral symmetry instead of a 6-order rotational symmetry. This time I ‘corrected’ it and all clovers have the same count. padded double stitch or pds (2 wraps on each half stitch). We can climb out with a split ring in clover and mock picot, thus tatting the entire snowflake in one pass. Instead of slope and roll join, I used lock join throughout, and counted it as first half stitch. Ring 3 : 3 + 3 – 6. rw. I didn’t change a thing here, except for the thread of course. Measurement: 4 cms from point to point. Techniques : 2 shuttles, ctm ; turn work ; lock join ; floating Josephine knots. TIP : All chains in 2nd round can be worked from the front without turning work at all. Use reverse (unflipped) stitch for the 6ds chain. This is just like block tatting, and here instead of lock join pull up a loop of ball/shuttle2 thread, pass core shuttle through it, and tension. Again, I used small picots to link adjacent rings in central medallion instead of the original central picot. All the rest remains the same as in Version 2 of the pattern. Thus each inner ring is (7-6-7), although one can add decorative picot, thus working them as (7-3-3-7). Measurement: just over 2½ inches. It is interesting how the dot is smaller than the JR, despite having exactly same count. Also notice the outline – dot has an irregular outline as compared to the smooth circle of a JR.
For a pointier outer chain, work the JR as a SCMR instead of a thrown ring. Although I like the gently curved chain. Although not mentioned, all my tatting is directional – frontside/backside. as is spring, summer, monsoon, and fall !!! 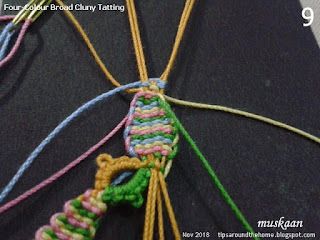 Final installment of colour Cluny tatting pictorials. 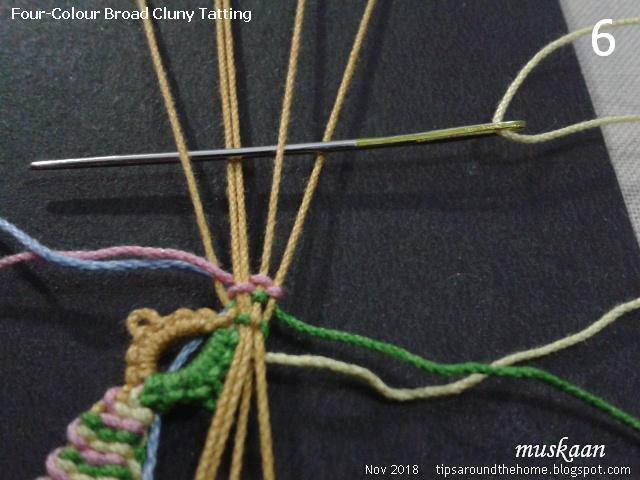 This collage shows the progression of Colour/striped Cluny Tatting pictorials I shared this year. While stepwise directions are given for regular tallies (and a broad one below), the same concept can be applied to Hanging Cluny Leaves, as seen in the collage center. 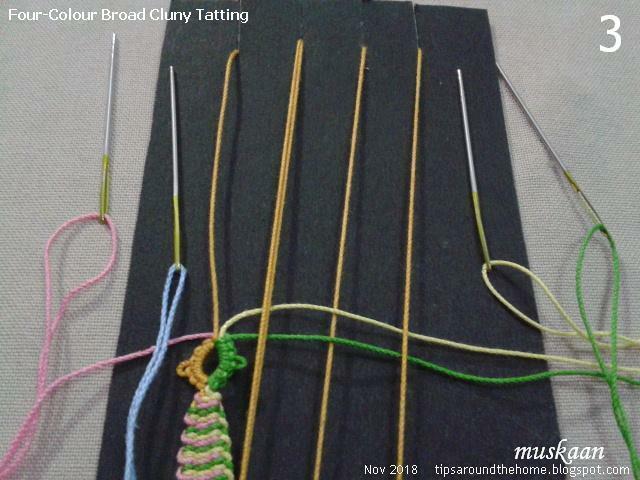 Using 4 colours for Cluny tatting meant the coloured stripes would show better in a broad tally. Hence I resorted to a 4-Warp loom and also changed the leaf shape a bit. 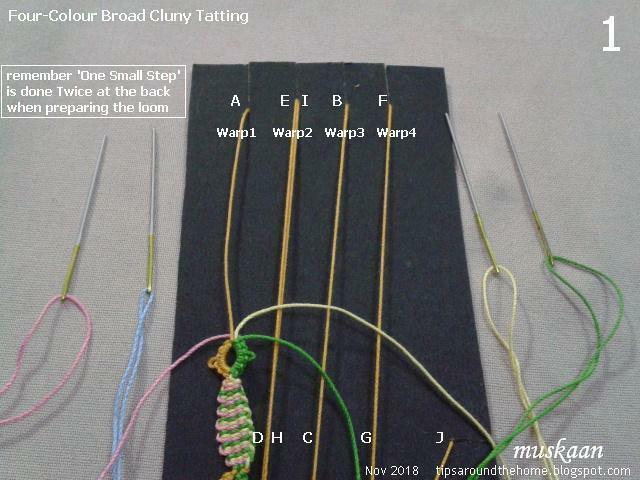 how to weave a 4-Warp loom – click to download pdf for stepwise directions. My one small step really comes in handy here since multiple loops need to be closed in the end. It is done Twice in a 4-Warp loom because there are 2 top loops to close at the end. 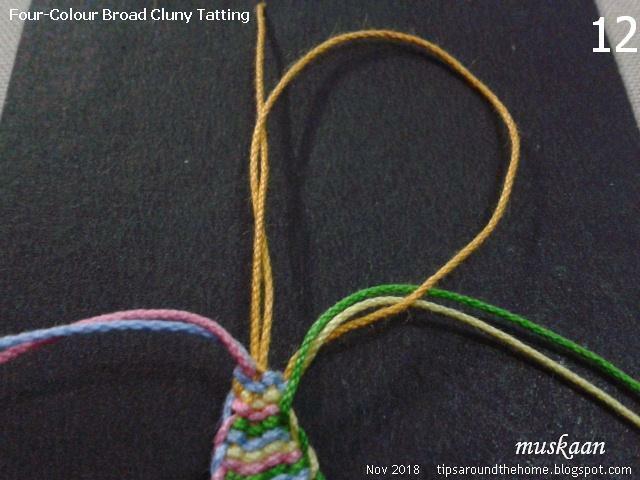 Continuing with the braid from the 3 colour tally, I made a split ring, encapsulating the pink and yellow threads on either side. 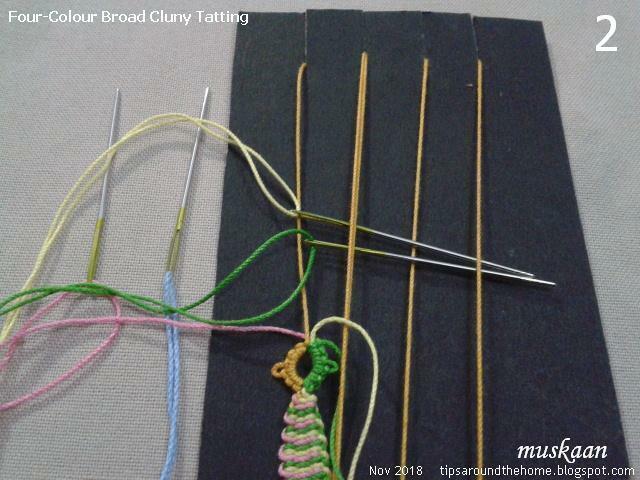 Then I brought in the 5th thread – blue and mustard was again used for the loom. I recommend hitching the loom before actual weaving commences. These year-old pics do not show that step. how to add new thread and hide the tail in the Cluny leaf. how to hide loom colour blip on top. Only major steps are shown below. eg. only one pass of a weave/wrap is shown. But remember to bring the thread back to the side where it starts. One Small Step is done twice – under the AB bar, and again under EF bar. 2. 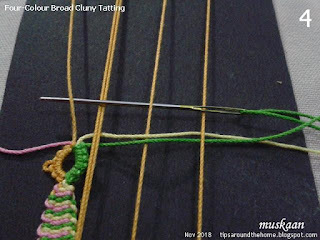 Bring 2 colours/threads to the right side, making a pass (under-over-under). 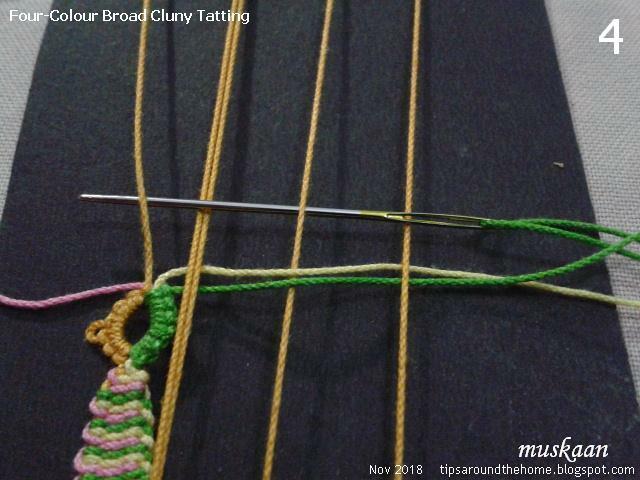 Before this step, I now find hitching the loom helps center the tally and hide any colour blips. (not shown here, since these pics were taken a year back). 3. All 4 needles/threads are in place, 2 on either side. 4. Start weaving with green keeping yellow below: over-under-over-under to the left. Return to the right : under-over-under-over (not shown) to complete 1 weave or wrap. 5. Pick up pink from the left, entrapping blue within and move to right : over-under-over-under. Return to left : under-over-under-over (not shown) to complete 1 weave/wrap. 6. 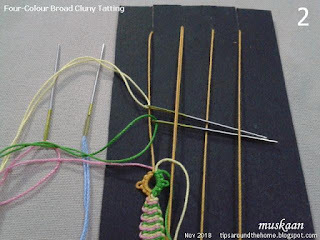 Pick up yellow, entrapping green, and make 1 weave/wrap as in step#4. 7. 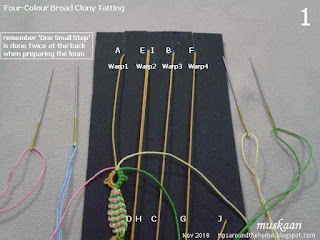 Pick up blue, entrapping pink, and make 1 weave/wrap as in step#5. Remember to keep tensioning and packing down the weaves. making a single weave colour strip. 8. Repeat from #4 to #7 to desired shape and size. Note: colour placement and width of each colour strip depends on pattern and desired effect. 9. The broad 4-coloured striped tally is complete. 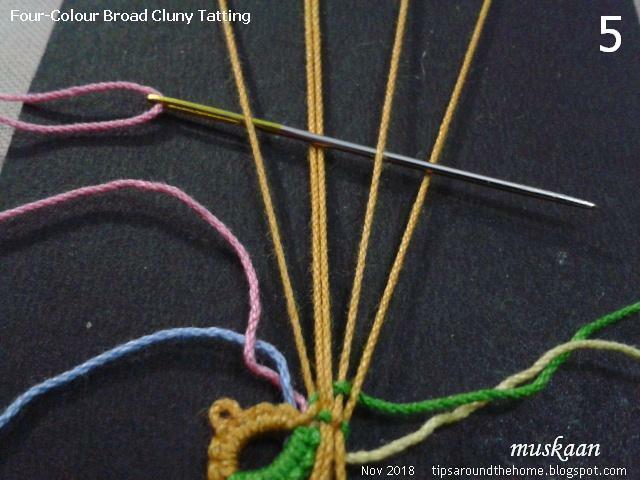 bring pink & blue needles from under the AB loop and close loop by pulling downward at BC. 11. Pass green & yellow needles through the EF loop from above, …. 12. 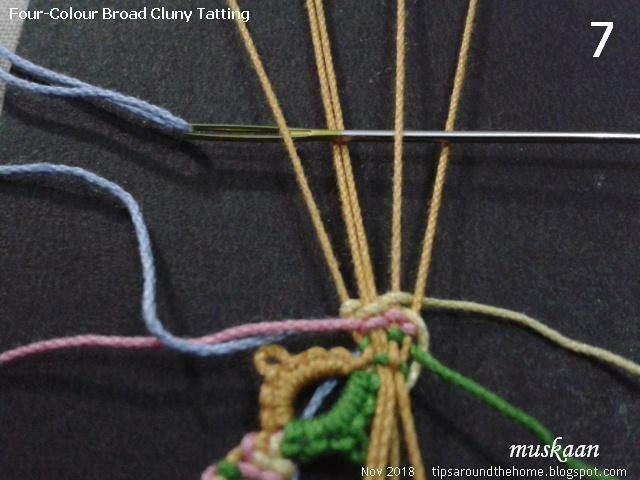 … pull off the EF loop from loom and close by pulling downwards at FG. 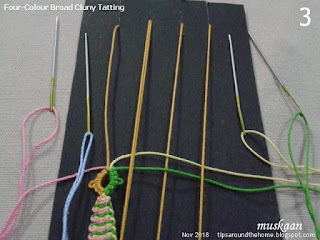 Then pull the remaining single loom thread upwards at I to finally close the tally (not shown). 13. 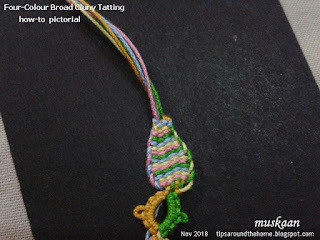 One broad 4-colour striped tally made. The pic shows the tally first from the front, then from the back. This collage shows the application of coloured/striped tallies in various projects. 3-colour pendant and diya flame prototypes. I have a couple of practice patterns on the draft board for 3- and 4-colour Cluny leaves but may not be able to get to them till the new year. But stay tuned, one never knows when inspiration to weave may loom large on the horizon! There are definitely some non-Cluny patterns in the next few posts! Who said the thieves were fools?! 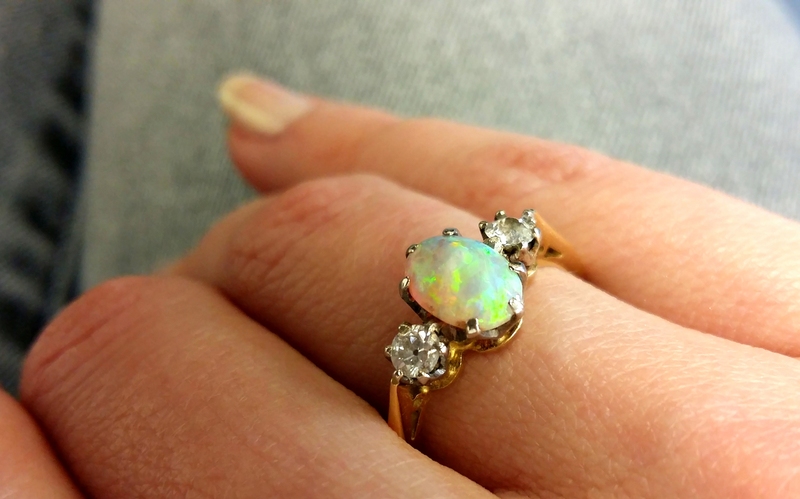 They were old hands at remaining free and unfettered (that's how they amassed that vast treasure stashed in the cave!*)! So, when 20 of their mates went missing – some wound tight, some cornered, roped in, corralled, split down the middle, and what not - they got into a consultative huddle to chart their future course of action. Most importantly how to avoid detection. By now they had realised that moving alone or in small groups made them easy targets. Henceforth they would move en bloc; split into 2 groups of 10 each seemed a safe bet to overcome their unseen enemy, Alibaba. But our Alibaba was smarter by far and changed his MO (modus operandi), He laid a sweet honey-trap. Who can resist a ‘sweetmeat’ ;-P He put forward his clever and resourceful slave girl, Marĵanah (Morgĩana in some online versions, pronounced Marjiinaa) who enticed and lured the entire group of 10 thieves to partake of the very many tasty candies till they doubled up in pain arising from decaying teeth! Who can think of anything else with a bad case of toothache, and were easily rounded up. How cheeky of Alibaba – Was he being unethical and unfair in compromising their long-term oral health? Sadly, all’s fair in love and war. So parading here are the captured blossoms motifs from 21 to 30, with their stitch count inked in respective images. Techniques : rosette ; picot join to the right ; luggage tag loop or larks head knot ; lock join. All worked in Lizbeth size 20 threads with a single shuttle. This motif works well as an asymmetrical or freestyle corner motif. A Blossoms spinning wheel mat ???? All Blossoms Motifs patterns will be listed here under Nature 2D.